The Windows 8 SmartScreen filter was originally introduced in Windows 7 to help prevent phishing and malware infections. It was integrated into Internet Explorer, Hotmail, and now the Windows 8 OS. In this article, we look at what exactly the SmartScreen Filters does in Windows 8, along with how to disable it and the concerns it brings up for privacy advocates. 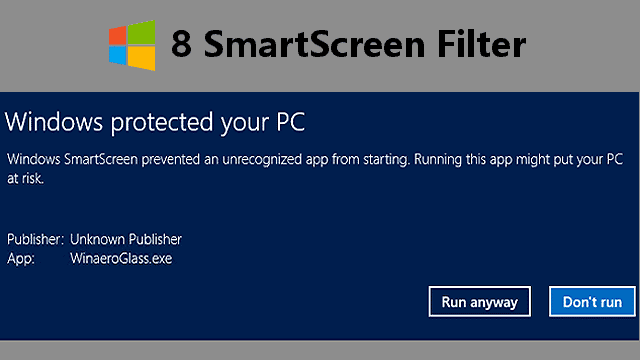 The SmartScreen Filter is integrated into the entirety of Windows 8 to help identify harmful malware and installers on your PC. Whenever you download something from the Web, if you aren’t sure where it came from – and even in cases where you know where it’s from – you can still be infected by malware lurking within its structure. The SmartScreen Filter utilizes a master database Microsoft has compiled from a variety of sources to warn you about potential issues when you open a new installer or program. Within the confines of Internet Explorer 10 and 11, the Windows 8 SmartScreen Filter can identify common phishing attempts, malware-based websites and more. The Windows 8 SmartScreen Filter is not an anti-virus or spyware program. It won’t actively scan your PC for threats like those types of software will. Instead, the SmartScreen Filter is a reactive program that will alert you to potential threats as they present themselves. It’s also only integrated into IE, so if you use another browser, you’re on your own. You can modify or disable the SmartScreen Filter by either going to your Start Screen and searching for “SmartScreen” or opening up the Action Center from your desktop. 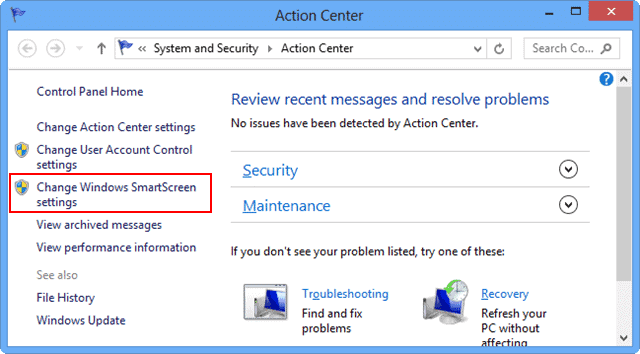 Click on “Change Windows SmartScreen settings” on the left-hand side of the Action Center window. You will need to be logged into your PC’s Administrator account or have access to the password to bypass the UAC. SmartScreen has three settings for you to use: Get Administrator permission before running an app, warn before running an app or turn it off entirely. The latter turns SmartScreen off throughout Windows 8. Before turning SmartScreen off completely, ensure you have adequate anti-virus, spyware and malware protection to keep yourself safe when using the Web. 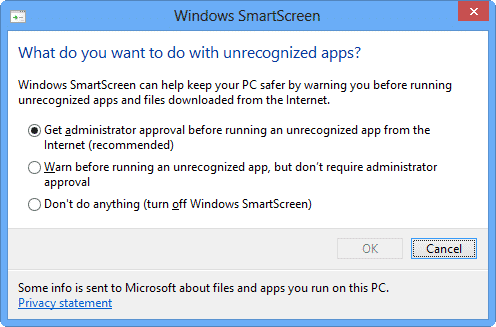 The first option – Get Administrator permission before running apps – requires the Administrator or someone with their password to override the UAC that pops up every time you run a new app or installer. The second option – Warn before running apps – requires you to click-through a set of pop-ups to get an app or installer to run. For most users, this may be the right setting to use to offer an extra layer of security when utilizing Windows 8. After selecting an option, click “OK” to save your settings. If you turn SmartScreen offer entirely, you’ll be awarded a pop-up balloon on your desktop warning you about it. If you head back to the Action Center, you can disable notifications about it being turned off entirely so you don’t have to see them all the time after turning SmartScreen off entirely. At any time you want to change your SmartScreen settings, you can head back to the Action Center and follow the same steps above to tweak its level of protection. The integration of SmartScreen into Windows 8 has caused numerous privacy concerns to come to the attention of Microsoft. When SmartScreen scans a file or installer, it sends your IP address back to Microsoft in the form of a hash file. While this hash file is encrypted, it still has information about you contained in it. Microsoft has stated that this information is a normal collection habit of many websites and services, many users feel it’s not necessary for SmartScreen to perform its role. Computers are meant to make our lives easier, especially when it comes to getting on the Web. The Windows 8 SmartScreen Filter is meant to help protect you from harm online. However, with the recent concerns about privacy and intrusion, you may not feel as if the SmartScreen Filter has anything to offer you. Windows 8 lets you disable it, but remember why it was introduced in the first place: To help keep you safe from harmful files, downloads, and installers. Preventing phishing and malware can be done in multiple ways, and SmartScreen is just another way. Next articleIs This the End of Android Rooting? If So, Is That Bad?